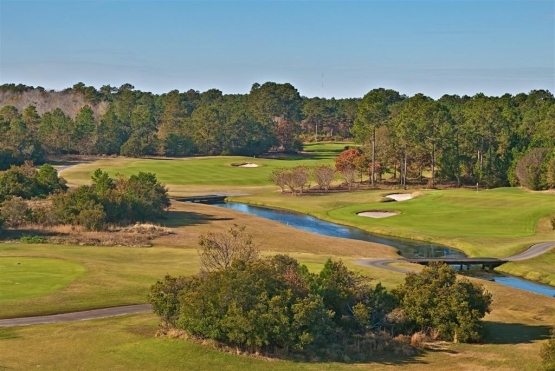 The Legends Heathland course is located at the Legends Golf and Resort in Myrtle Beach. Designed by golf course architect Tom Doak, the Heathland course uses the natural terrain to duplicate the links characteristics of the British Isles. Several holes remind you of holes from St. Andrews, Lahinch and Cruden Bay. This 18-hole Myrtle Beach golf course will test your golf skills as you play through the continuous Myrtle Beach breezes while trying to avoid the cavernous deep faced bunkers, streams and natural hazards. The Heathland course features beautiful Champions Bermuda greens. If you are looking for the best Myrtle Beach golf deals you may want to include the Legends Heathland in your Myrtle Beach golf package. The Grand Strand offers the very finest In Myrtle Beach and North Myrtle Beach accommodations with its outstanding Myrtle Beach condos and hotels. While you are visiting Myrtle Beach you might want to take advantage of some of the world class Myrtle Beach golf instruction with a Myrtle Beach golf lesson. If you are looking for some new golf equipment, Myrtle Beach and North Myrtle Beach have outstanding golf retail outlets such as the PGA Tour Superstore and GolfSmith. They offer a huge selection of the latest in golf equipment, apparel and accessories. You will certainly be “Styling” on the beautiful Myrtle Beach championship golf courses. Book your Myrtle Beach golf package today! Excellent, links type, but everything is visible, good quality turf like other Legends courses.